They are disrupting the scenario in which publishing brands create, orchestrate and distribute contents. People inform themselves using the device nearest to them, independently of context. People seek information online as soon as they become aware of a piece of news or an event. 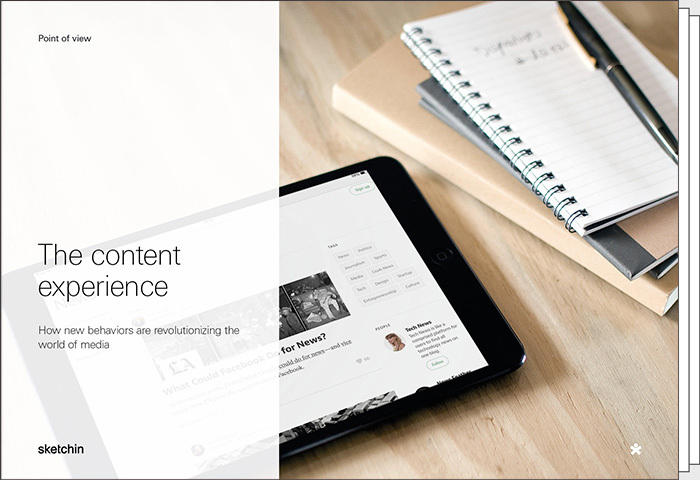 People acquire further insight into content starting with paper and continuing to digital. People do not distinguish between digital, paper, and television brands and always expect total coherence between them. People never draw from only one single source. People switch the channel they are using based on the succession of news, regardless of the platform that provides them. People are prepared to pay for a specific digital content only when they are in need of it. People love publishing products that are simple and with a strong value proposition. People comment on social networks, but in an increasingly private and selective fashion. People seek both authoritative and entertaining content, but do not accept both from the same. People take the media for granted, without perceiving it as a plus. We are a smart, strategic, design firm based in Lugano, Atlanta and San Francisco. During the past 3 years, we’ve spent thousands of hours in designing products and services for the publishing industry.